Operations to open the Canyon uranium mine, located six miles south of the Grand Canyon National Park, were suspended in early November. This is the second time in as many decades that the plans of Energy Fuels Resources, Inc. to sink the drilling shaft have been halted. The Canyon mine operations were first placed in standby mode in 1992, after uranium prices plunged to record lows. The Havasupi Tribe, who live in the bottom of the Grand Canyon, has challenged the mine since it was first proposed. It was joined by conservation groups, including the Grand Canyon Trust, Center for Biological Diversity and the Sierra Club, to file lawsuits against the Canyon mine. Together they have been working to stop the mine because of the potential harm to waters and wildlife of the Grand Canyon, as well as cultural resources. The U.S. Forest Service approved the plan of Energy Fuels to sink the shaft to approximately 1,500 feet to access the uranium ore. The mine plans to use in-situ uranium mining methods. The shaft has been drilled to about 300 feet. All surface development has been done, including the head-frame, the hoist, evaporation ponds, buildings, and environmental monitoring facilities. In early 2013, the mining corporation resumed shaft-sinking operations. 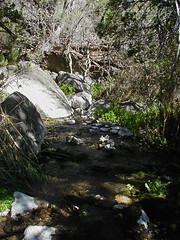 The Havasupi Tribe, along with the conservation groups, responded by filing a lawsuit in the U.S. District Court for the District of Arizona alleging that the Forest Service had failed to comply with the federal laws pertaining to the mine operations, sought to halt further development of the mine until the Forest Service complied with their legal responsibilities, and requested an injunction to stop the development. The District Court denied their motion. In response, the Plaintiffs filed an appeal with the U.S. Circuit Court of Appeals for the Ninth Circuit because the lower court in Arizona denied their motion for an emergency injunction to stop the drilling. The parties then reached an agreement to suspend operations pending a decision in the District Court of Arizona, or until December 31, 2014. Energy Fuels cited “business reasons” for its decision to place the mine in non-operational, standby status. Again, the price of uranium has dropped to a five-year low. This has been the CCNS News Update. To make an end of the year tax-deductible contribution, please visit our website at nuclearactive.org.